Cocoon Coatings does a lot of business that is weather dependent. Fortunately for us today, our installation team is up in Sydney completing some indoor Epoxy Floorings work. 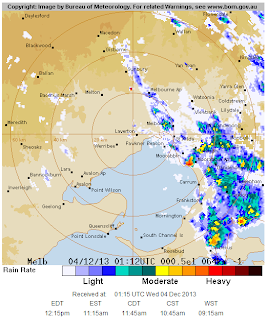 Here in Bayswater, however, someone left the shower on. 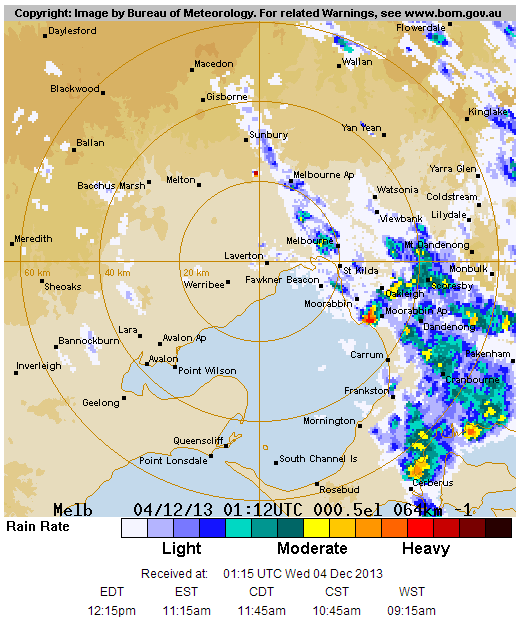 One of our favourite tools at Cocoon is the Weather Radar provided by the Bureau of Meteorology. Here's an image from a few minutes ago. We know all too well how much damage can be done with a leaking roof: damaged framing, electrical shock, mould, and disintegrating walls are all potential outcomes. At Cocoon Coatings, we can install a waterproofing membrane that also includes solar reflective properties, so once you've saved your roof, you'll continue to reap energy savings. Find out more about Cocoon's Waterproofing Membranes! Project news and insights into the Cocoon Coating business and our range of environmental coatings.